In human anatomy, the subclavian arteries are paired major arteries of the upper thorax, below the clavicle. They receive blood from the aortic arch. The left subclavian artery supplies blood to the left arm and the right subclavian artery supplies blood to the right arm, with some branches supplying the head and thorax. On the left side of the body, the subclavian comes directly off the aortic arch, while on the right side it arises from the relatively short brachiocephalic artery when it bifurcates into the subclavian and the right common carotid artery. Schematic of the proximal aorta and its branches. The left subclavian artery is the fifth branch of the aorta and the third branch from the arch of the aorta. The right subclavian artery arises from the brachiocephalic artery (labeled "innominate" on diagram). The usual branches of the subclavian on both sides of the body are the vertebral artery, the internal thoracic artery, the thyrocervical trunk, the costocervical trunk and the dorsal scapular artery, which may branch off the transverse cervical artery which is a branch of the thyrocervical trunk. The subclavian becomes the axillary artery at the lateral border of the first rib. From its origin, the subclavian artery travels laterally, passing between anterior and middle scalene muscles, with the anterior scalene (scalenus anterior) on its anterior side and the middle scalene (scalenus medius) on its posterior. This is in contrast to the subclavian vein, which travels anterior to the scalenus anterior. As the subclavian artery crosses the lateral border of the first rib, it becomes the axillary artery. On the right side the subclavian artery arises from the brachiocephalic (innominate) artery behind the right sternoclavicular articulation; on the left side it springs from the arch of the aorta. The two vessels, therefore, in the first part of their course, differ in length, direction, and relation with neighboring structures. The first portion extends from the origin of the vessel to the medial border of the Scalenus anterior. The second lies behind this muscle. The third extends from the lateral margin of the muscle to the outer border of the first rib, where it becomes the axillary artery. The first portions of the two vessels require separate descriptions; the second and third parts of the two arteries are practically alike. The first part of the right subclavian artery arises from the brachiocephalic trunk, behind the upper part of the right sternoclavicular articulation, and passes upward and lateralward to the medial margin of the Scalenus anterior. It ascends a little above the clavicle, the extent to which it does so varying in different cases. It is covered, in front, by the integument, superficial fascia, the Platysma (platysma) muscle, deep fascia, the clavicular origin of the Sternocleidomastoideus (sternocleidomastoid) muscle, the Sternohyoideus (sternohyoid) muscle, and the Sternothyreoideus (sternothyroid) muscle, and another layer of the deep fascia. It is crossed by the internal jugular vein and the vertebral vein, by the vagus nerve and the cardiac branches of the vagus and sympathetic, and by the subclavian loop of the sympathetic trunk which forms a ring around the vessel. The anterior jugular vein is directed laterally in front of the artery, but is separated from it by the Sternohyoideus and Sternothyreoideus. Below and behind the artery is the pleura, which separates it from the apex of the lung; behind is the sympathetic trunk, the Longus collie and the first thoracic vertebra (T1). The right recurrent nerve winds around the lower and back part of the vessel. The first part of the left subclavian artery arises from the arch of the aorta, behind the left common carotid, and at the level of the fourth thoracic vertebra; it ascends in the superior mediastinal cavity to the root of the neck and then arches lateralward to the medial border of the Scalenus anterior. It is in relation, in front, with the vagus, cardiac, and phrenic nerves, which lie parallel with it, the left common carotid artery, left internal jugular and vertebral veins, and the commencement of the left innominate vein, and is covered by the Sternothyroideus, Sternohyoideus, and Sternocleidomastoideus; behind, it is in relation with the esophagus, thoracic duct, left recurrent laryngeal nerve, inferior cervical ganglion of the sympathetic trunk, and Longus colli; higher up, however, the esophagus and thoracic duct lie to its right side; the latter ultimately arching over the vessel to join the angle of union between the subclavian and internal jugular veins. Medial to it are the esophagus, trachea, thoracic duct, and left recurrent laryngeal nerve; lateral to it, the left pleura and lung. The second portion of the subclavian artery lies behind the Scalenus anterior (anterior scalene) muscle; it is very short, and forms the highest part of the arch described by the vessel. It is covered, in front, by the skin, the superficial fascia, the Platysma muscle, the deep cervical fascia, the Sternocleidomastoideus, and Scalenus anterior. On the right side of the neck the phrenic nerve is separated from the second part of the artery by the Scalenus anterior, while on the left side it crosses the first part of the artery close to the medial edge of the muscle. Behind the vessel are the pleura and the Scalenus medius (medial, or middle, scalene) muscle; above, the brachial plexus of nerves; below, the pleura. 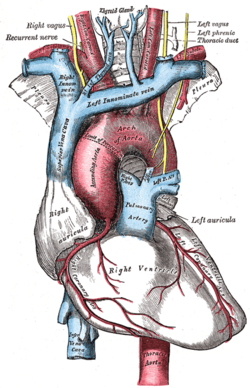 The subclavian vein lies below and in front of the artery, separated from it by the Scalenus anterior. The third portion of the subclavian artery runs downward and lateralward from the lateral margin of the Scalenus anterior to the outer border of the first rib, where it becomes the axillary artery. This is the most superficial portion of the vessel, and is contained in the subclavian triangle. It is covered, in front, by the skin, the superficial fascia, the Platysma, the supraclavicular nerves, and the deep cervical fascia. The external jugular vein crosses its medial part and receives the transverse scapular, transverse cervical, and anterior jugular veins, which frequently form a plexus in front of the artery. Behind the veins, the nerve to the Subclavius descends in front of the artery. The terminal part of the artery lies behind the clavicle and the Subclavius and is crossed by the transverse scapular vessels. The subclavian vein is in front of and at a slightly lower level than the artery. Behind, it lies on the lowest trunk of the brachial plexus, which intervenes between it and the Scalenus medius. Above and to its lateral side are the upper trunks of the brachial plexus and the Omohyoideus. Below, it rests on the upper surface of the first rib. Superficial dissection of the right side of the neck, showing the carotid and subclavian arteries. Branch of vertebral artery and thyrocervical trunk is labeled. Internal thoracic artery branches from same segment, but inferiorily, and is therefore not visible. Vertebral artery Runs cranially in the transverse foramina of the cervical vertebrae, joins the vertebral artery on the contralateral side, forming the basilar artery and joins the circle of Willis. Costocervical trunk Splits into superior intercostal artery and deep cervical artery. Dorsal scapular artery From either second or third part. Passes backwards to supply levator scapulae and rhomboids. Essentially, the 4th aortic arch and dorsal aorta form the aortic arch on the left, but since the right dorsal aorta regresses distal to the right 7th intersegmental artery, on the left they form the proximal portion of the subclavian artery. Since the left subclavian is then a tributary of the left common carotid, they can be thought of as arising from the brachiocephalic trunk. The subclavian arteries vary in their origin, their course, and the height to which they rise in the neck. The origin of the right subclavian from the innominate takes place, in some cases, above the sternoclavicular articulation, and occasionally, but less frequently, below that joint. The artery may arise as a separate trunk from the arch of the aorta, and in such cases it may be either the first, second, third, or even the last branch derived from that vessel; in the majority, however, it is the first or last, rarely the second or third. When it is the first branch, it occupies the ordinary position of the innominate artery; when the second or third, it gains its usual position by passing behind the right carotid; and when the last branch, it arises from the left extremity of the arch, and passes obliquely toward the right side, usually behind the trachea, esophagus, and right carotid, sometimes between the esophagus and trachea, to the upper border of the first rib, whence it follows its ordinary course. In very rare instances, this vessel arises from the thoracic aorta, as low down as the fourth thoracic vertebra. Occasionally, it perforates the Scalenus anterior; more rarely it passes in front of that muscle. Sometimes the subclavian vein passes with the artery behind the Scalenus anterior. The artery may ascend as high as 4 cm. above the clavicle, or any intermediate point between this and the upper border of the bone, the right subclavian usually ascending higher than the left. The left subclavian artery is more deeply placed than the right in the first part of its course, and, as a rule, does not reach quite as high a level in the neck. The posterior border of the Sternocleidomastoideus corresponds pretty closely to the lateral border of the Scalenus anterior, so that the third portion of the artery, the part most accessible for operation, lies immediately lateral to the posterior border of the Sternocleidomastoideus. Some authors describe the subclavian artery as arising from the 7th intersegmental artery. ^ "Neck Flashcards - Quizlet". Quizlet. Retrieved 4 April 2018. ^ "Aortic arches". www.embryology.ch. Retrieved 12 July 2016. Wikimedia Commons has media related to Subclavian arteries.